The city is losing millions of dollars every year under its ongoing program that reduces — and, in some cases, completely eliminates — illegal parking tickets on major trucking companies, a new report argues. IBO Director of Budget Review Jonathan Rosenberg said he could not put an exact figure on how much the city is losing because under the Stipulated Fine Program, participating companies agree to not challenge tickets in court in exchange for dramatically reduced fees on each ticket. Advocates say the city should bite the bullet: get rid of the program and hire more hearing officers to adjudicate the tickets. 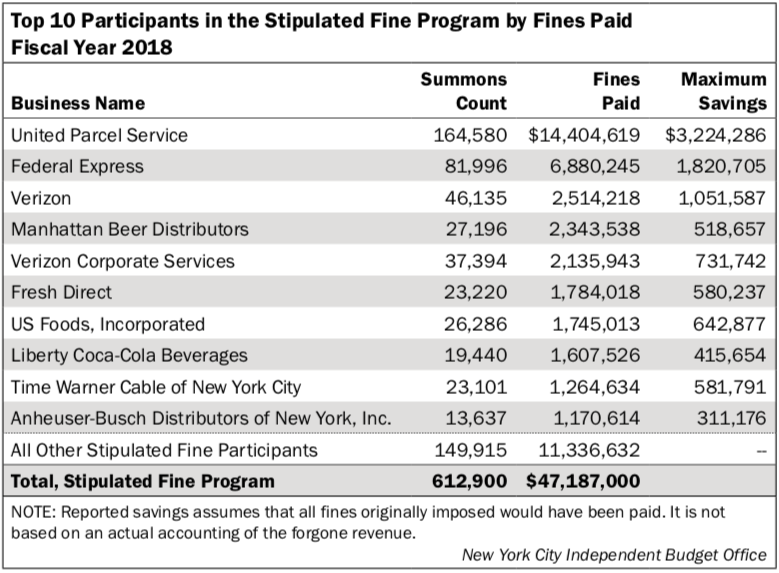 The reduced fines — a $115 double-parking or no-standing ticket is knocked down to a mere $35, for example — not only save the companies millions, but increase the incentive to illegally park virtually everywhere. The IBO report suggests that the city isn’t getting enough benefit to justify the safety hazards and congestion caused double- and illegally parked trucks. “[They] get a free pass to block our cramped streets at the expense of our safety,” Constantinides added. “It’s far too often that pedestrians and cyclists have to go around idling trucks — which also send harmful, toxic exhaust into the air — unsure of what’s coming around the other side. “Ending this program is a bold step in making our streets livable,” he concluded. Others have called for the city to create more loading zones by ending the practice of allowing car owners to store their vehicles — for free — for most of the day along virtually all residential curbsides. That practice is commonly referred to as “parking,” but it represents a multi-million subsidy to car owners at the expense of drivers in motion, cyclists, pedestrians and delivery workers. The IBO reported that the number of summonses written by police has plummeted since a high of more than 986,600 in 2015, down to 678,100 last year, a drop of 31 percent. The report does not say why, but the drop in tickets could stem from a lack of incentive on the part of officers to write summonses when they know the violator will automatically pay a dramatically reduced amount. 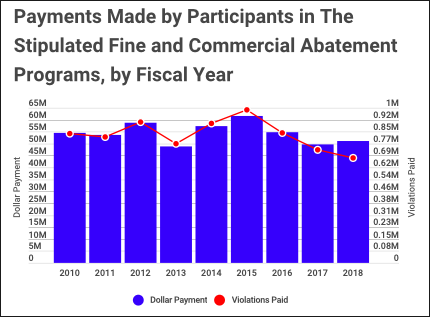 In December, the Department of Finance, which created the Stipulated Fine Program 15 years ago, did increase the fines for each type of violation — reducing the number of $0 fines from 19 general categories to just two — and says it now expects the programs to generate $11 million more this fiscal year than it did in 2018. This is a basic market failure. Penalties should increase according to the number of violations a company receives–the more violations, the higher the penalty–until the company reaches a point at which it will ensure that its trucks no longer violate traffic laws (i.e. where they lose money on the shipment if they receive another violation). Illegally parked commercial vehicles should NOT be given tickets in the first place if there is no legal alternative. NYC needs to focus on fixing its dysfunctional curbside parking regulations. There should be available loading/unloading everywhere needed. Free and underpriced curbside parking needs to be priced according to demand to keep spots free on every block at all times. Parking placard use needs to end. The expectation that certain people (city employees, elected officials, etc) are entitled to free convenient parking, and can park illegally with impunity, needs to end. Commercial vehicles need to be given a legal alternative. Right now the choice is to park illegally or not do business. the drop in tickets could stem from a lack of incentive on the part of officers to write summonses when they know the violator will automatically pay a dramatically reduced amount. Could anyone explain why this makes sense? If you have guaranteed revenue and tickets from a company that is openly breaking the law and giving up their right to challenge it, wouldn’t that mean a greater incentive to write tickets? I’m surprised the lost revenue is so low compared with the money collected, to be honest. Should do the same for red light cameras, speed camera and all parking tickets. Escalate the fines for repeat violations until people stop doing it. The ticket writer does not see a dime of the mo oy from a ticket written. The only incentive they have to write tickets is seeing their number of tickets stays and meeting their quotas. The error of this story’s superficial analysis: complaining about the symptom — illegally parked commercial vehicles — while ignoring the underlying problem — private cars hogging curbside space. One omission — and it’s critical: not only must the price of parking private cars on public streets be higher than nearby private parking, enforcing turnover is an essential part of the solution. Turnover is not merely a matter of pricing. Limit on-street parking for private cars to 1 or 2 hours, and vigorously enforce the cap. There is always a legal alternative. It may be a block or two away; but it exists. Enforce the hell out of this, force these delivery trucks to park legally and lose time, and then watch the delivery companies lead the charge for loading zones. Also, even if it’s priced properly, we should only allow curbside private car storage when there’s no better use for the space. In most of Manhattan that space is better used for bus lanes, bike lanes, loading zones, even curbside cafes, than for car storage. I agree with your basic point. However, it is never acceptable to park (in full or in part) on a sidewalk or in a bike lane or in a bus lane/bus stop or in a crosswalk. UPS and FedEx should be our allies here in fighting for loading zones that aren’t immediately taken over by placards. But as long as they can park on the sidewalk with impunity, they have no incentive to be our allies. While I can’t agree that they shouldn’t be ticketed, as a rule, it is disappointed to see streetsblog focus on the symptom (commercial and delivery double parking) and not the disease (curbside mismanagement and under-pricing). Anyone who orders something to be delivered – whether from Amazon or a furniture or appliance store – contributes to this problem. That means pretty much all of us. We need more loading zones and fewer cars. A leaked document reveals a much higher cost of the city's Stipulated Fine Program.